Personality: He can be a bit cocky, he’s a klutz, and he likes to joke around, but he knows when to be serious about things. ScurCrow was born and raised in Void city. When he was little he always wanted to be a hero like all the others in Void and when he reached the age of 18 he did try to go out and save some innocent people from a villain, but he only screwed things up and caused a hell of a lot of damage to the city instead. For having caused so much damaged to Void city, he was sentenced to prison for 3 years. After he got out of prison he hasn’t tried to do anything out of his league, but he will (from time to time) help some people out with certain things such as, being their body guard or just protecting a kid from bullies and other lame stuff like that. Normally he will charge a person a certain amount of money for his assistance, depending on their age….. 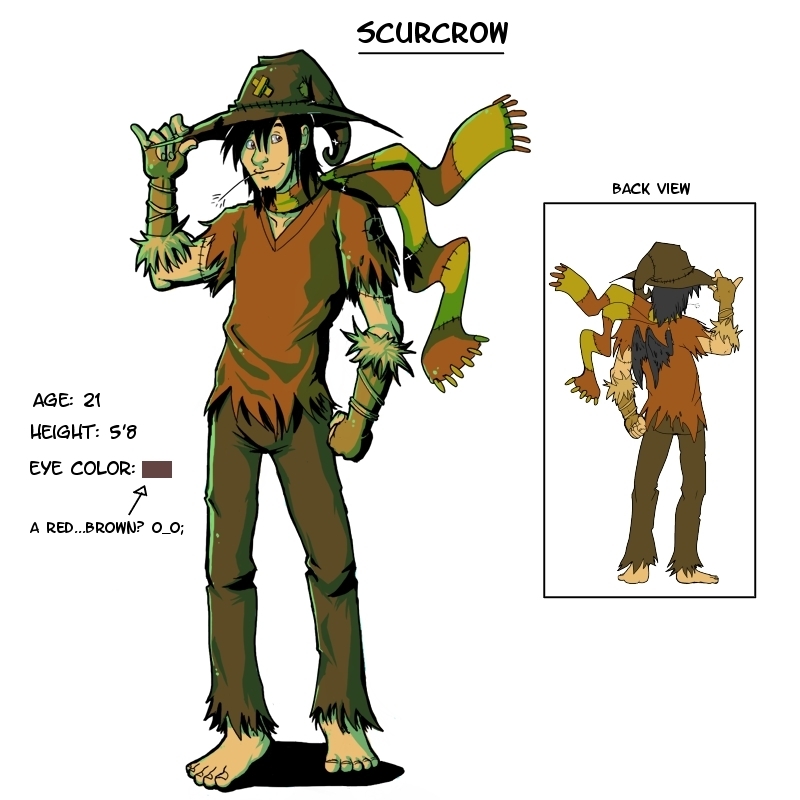 There are not that many people that ask ScurCrow for his help, actually there are still several people that just laugh at him. *Scurcrow can fly; his wings can quickly grow to a much bigger size. *If his wings were ripped off, they would grow back within a few weeks or so. *He does dress casual sometimes. *He can talk to birds. *The stitches on his arms are actually tattoos. *He has pretty darn good eyesight. *He likes to play the acoustic guitar, actually he can play a bunch of different instruments (flute, violin, piano, etc)...but none that he can play extremely well, he's just ok with them.